It’s been seven long years since Give Me Your Soul…Please came out, so for the longtime KING DIAMOND fan expecting a new release from the master of horror, Dreams Of Horror may be somewhat of a letdown. However, putting out a “best of” double set that chronologically lays out his entire career can’t be all bad either. When Fatal Portrait came out, KING DIAMOND would immediately rise to my all-time favorite band and vocalist. Those haunting operatic vocals, outrageously high screams and chilling backing vocals set this band apart from anything I had listened to up to that point. 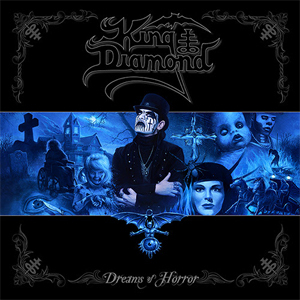 If you have never heard of KING DIAMOND or are new to his work, then this set is an excellent way to get familiar with the band’s music from their formation after dissolving MERCYFUL FATE in the late 80’s, to the last release noted above. This double CD set sets the mood with the opener, “The Candle” and continues in sequential order with, for the most part, two songs from every CD released up through Give Me Your Soul. The King himself, together with guitarist Andy LaRocque, meticulously handpicked each of the songs in this set and remastered all of them for great sound quality. Since we didn’t get new material this time around, it would have been really cool if they had totally rerecorded all of these songs with a fresh mix, but overall the sound is cleaner than the original recordings. Songs included in this set are the well-known classics like “Family Ghost” from Abigail, “Welcome Home” from Them, “Sleepless Nights” from Conspiracy and “The Puppet Master”. Listeners will also find a lot of tracks from lesser known albums like “Voodoo”, “Spirits”, “Heads On The Wall” and “Black Devil”. A little bit confusing was to hear a couple instrumentals thrown into the mix. Don't get me wrong, they are great contributions to this set, but these easily could've been replaced with songs off of The Dark Sides that came out after Them like "Shrine" or "The Lake". Although these were B-sides of singles that were released, so they weren't officially on any album (they should've been though) and could be the reason for not including them. Overall, Dreams Of Horror is a great journey spanning the decades of the mighty KING DIAMOND and is a killer set for anyone’s collection. Spanning 23 songs in all, start it up and hang on for an hour and fifty minutes of horror remastered as only the King can deliver. Again, wishing this was new material, but it’s a great double set nonetheless.